My family has always had a lot of trouble keeping track of our stockings. We would always have about a billion different red and white stockings floating around our Christmas stuff. We would take glitter and glue and write our names in cursive on the stockings, but without fail by the following year some of the glitter would come off. By that point a stocking would be missing and we'd have to buy a new stocking for someone. The dog would get an old stocking with somebody's glitter remnants. Every few years we would end up buying and redoing all new stockings because we couldn't stand the slight variations in red coloring, size, or texture. 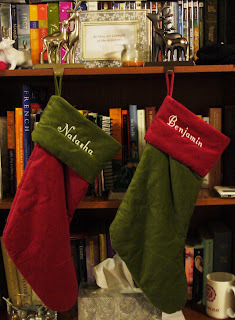 The stocking fiasco still continues yearly at my family's house, but I can't stand that sort of uncertainty. I mean, the suspense over whether or not your stocking is MIA is almost too much to handle. Plus, there was a fair amount of stocking hijacking going on. It is amazing how a little squinting and creative peeling of glitter glue can make the name Natasha look like Brittney and vice versa. 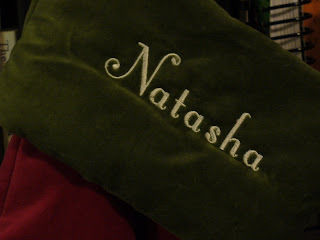 Last year I seized the opportunity to rid myself of the stocking conundrum by buying beautifully embroidered stockings from Pottery Barn. Yes, I spent a little more initially, but the happiness that the matching orderly stockings brings me is priceless. Maybe I'm bland and boring for not making my own or making sure everybody has something different, but I'm alright with boring. Boring is aesthetically pleasing. My stockings look like they are straight out of a warm and inviting catalog photo...and they are!!! I have the peace of mind that when I have children I will not have to spend forever searching through piles and piles of stockings to find one that only kind of matches. Nope, that won't be me because I can't do kind of matching. It must match exactly (did I mention I have OCD?). When the time comes I will just hop on my computer and go to the Pottery Barn website and fill out my order that will ship to me in 5-10 business days. When the time comes to get another stocking there will be no fight over glitter pen colors, no arguing over the prettier imitation velvet, and no lost stockings. Just a couple taps on the enter button and I will have another perfectly matching stocking. The simplicity of it all kind of makes me giddy. Natasha, you crack me up! I do have to say that your description is pretty accurate. But, you and Ben have beautiful stockings and one day, your grandchildren will say, "look at these cool old stockings our grandparents used". In all seriousness, this will be another nice tradition for your own family. Yep, glitter glue everywhere is pretty accurate for our family too. I seem unable to escape the stocking fiasco without glitter in my hair. Do we ever really get rid of glitter anyway?